Here is a tasty meal to help you with eating more vegetables in the New Year! First up, spinach! In a large skillet, heat the oil. Add the onions and saute until soft. Stir in the ginger and saute for another minute or so. Stir in the curry paste and sugar until the onions are coated with the paste and there are few lumps, about 2-3 minutes. Add the chickpeas and tomatoes and let it simmer for a minute or two. Stir in the spinach and water and cook until spinach is wilted, stirring occasionally. Stir in salt, taste and add more if desired. 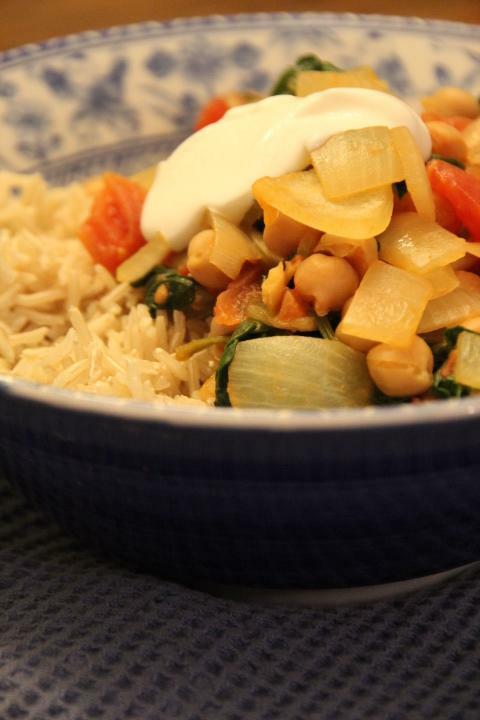 Serve with a dollop of plain yogurt, over brown rice. This recipe is cross-posted over at Simply Sugar and Gluten Free’s Slightly Indulgent Tuesday. Click on over and check out the other recipes!